Tea parties just got high-tech. According to cnet.com, the new Miito kettle is a first-of-its-kind piece of everyday technology that not only looks cool, but conserves energy as it heats. 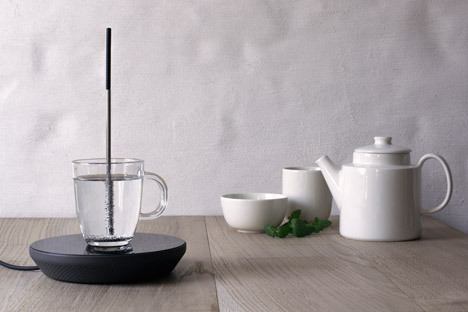 Winner of the James Dyson award, the Miito operates on the simple principle of induction. Do you take milk? Sugar? Perhaps a splash of science? A 4.5-cm. stainless steel rod is inserted into the desired drinking vessel, then placed on an induction plate. The plate contains an electromagnetic coil which generates a high-frequency electromagnetic field once powered up. The electromagnetism between the rod in the vessel and the coil in the plate generates enough heat to boil 200mL of water in 60 seconds. This allows for quick, non-wasteful heating that doesn't require an abundance of space, water, or weight - an attractive plus for some older tea connoisseurs. 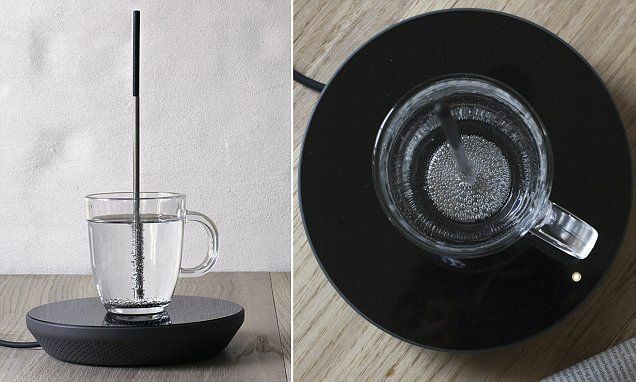 "We have emails from an elderly couple who were so eager to get their hands on a Miito, since they cannot lift normal electric kettles, but with Miito they could still easily make their cup of tea," co-designer Nils Chudy said. To an older person, this feels like it weighs as much as an actual elephant. Inspired by a TED talk which stated that £68 million ($106.5 million) worth of electricity was being wasted every year in the UK from sippers boiling too much tea water, designers Nils Chudy and Jasmina Grase set about revamping the traditional tea-service techniques. "My inspiration was the daily use of electric kettles. I wondered why all kettles look so similar. I quickly noticed that they not only look bad but they are also wastefully designed," Chudy explained. This does look hypnotically cooler than usual tea methods. The sustainability is nice, too. Thus, a new style for steeping was born (of course, it also works for soup, baby food, milk, or whatever other heated liquid you desire.) It works not just with teacups, but also cups, bowls, glasses, or any non-ferrous vessel. Miito is currently in development on Kickstarter, available for a donation of €90 (around $100.) Save time and energy while boiling brews future-style!